Exceptional place to stay! Owners were very friendly and helped us with reservations to the shows at Branson. We were able to go to eight shows while we were in Branson and six of the shows, we were to walk to from the campground. We were also able to walk to the Titanic Museum and most of the eating venues. Remember that you are in the Ozarks so be prepared for hills. Enjoyed this campground and will definitely stay here again! Their website really needs to have more information! Not mentioned anywhere: Gated entrance- good to know. BUT they have very specific rules on check in. They charge per hour an early arrival fee. They state they don’t park after 9. However to this park it means that you can NOT arrive after the office closes!! Apparently they must park you?! Not like the majority of parks that we have been to. If you arrive late you will not get to your site you paid for but a site outside the park with electric only. Very important information to have before you make a reservation. They don’t communicate very well and assume you understand the rules that have not been explained. Very nice park once we got there. Two dog parks, close to all the attractions. Stayed in site #5, pullthru. We have a 44ft Class A Motorhome & tow a pickup truck. Guided us to our site. Park road is narrow & steep, but we were able to navigate without "unhooking". Park is well maintained, clean & trees are pruned-no scratching RV. Trashcans are conveniently located throughout park with pickup up daily. Office staff were friendly & helpful from check-in to check-out. It's in a great location. Easy walk to several shows & restaurants. Best water pressure we've ever had! Four night stay in a class A motor home. Reserved site for Sept. stay in June. Requested a site for 36 foot motor home and a tow vehicle. Directed to a site numbered in the 90's by the "creek" The site sloped badly toward a gulch called a creek. The site was very tight with crushed rock and railroad ties separating the sites. All the sites in this area had the picnic tables (in poor shape) near the location of a neighbors sewer connection. I was advised not to back in too far to the gulch as the earth/crushed rock was not stable and could displace. The site was rated for a 38 foot RV with a tow. Backing in as far as safe there was not room for the tow to be parked completely off the roadway. I was unable for the first time in my three years of campground camping to level the coach, I used plastic pads(8) and 2x6 inch lumber sections to try to get the rear jacks down far enough to get level. Could not do.Settled for "excessive slope". Requested another space but the park was full. No credits or consideration. Water pressure touted to be 110 psi, no way,weak at best. If you like to hear sight seeing helicopters going over your site for 12 hours everyday then you'll love this place. Branson is enjoyable...MusicLand is not. Two adults. This RV Park was an emergency stop for us as the original RV Park we had planned on staying at was closed due to the flooding. Musicland went out of their way to accommodate us on the busy Memorial Day weekend, so extra kudos for that! The park was GORGEOUS! Lots of trees, so lots of shade! Even had a few squirrels and a lot of birds for our cats to enjoy watching! The park was so QUIET, we couldn't believe we were in the middle of downtown Branson! The park has a security gate and the bathrooms were exceptionally clean, as well! So, we will definitely be back with our cats! This is a nice campground in the heart of Branson. Service at check-in was very good with a very friendly staff. The "pull in"site was level and made up of gravel. It was just long enough for our motorhome but the car had to go next to the site. The campground is hilly and roads are just a bit tight but not a problem for our 42 ft motorhome. The utilities including WiFi worked well. The campground offers discounts to the many shows available in Branson and you can purchase the tickets right in the office. The staff was great and recommended shows and explained the shows we asked about. Overall a nice place to stay. Wonderful campground. Level sites. We stayed 4 nights wish we could have stayed longer. Campground staff are so friendly and helpful! We loved the people there, they were very accomadating and helpful. Even though we came in late to check in, they made sure they were there to help us back in. The location was very convenient, right next to the strip close to everything. We went in November when it was rainy and we had a few days of sun, but we loved our visit and we will be back! 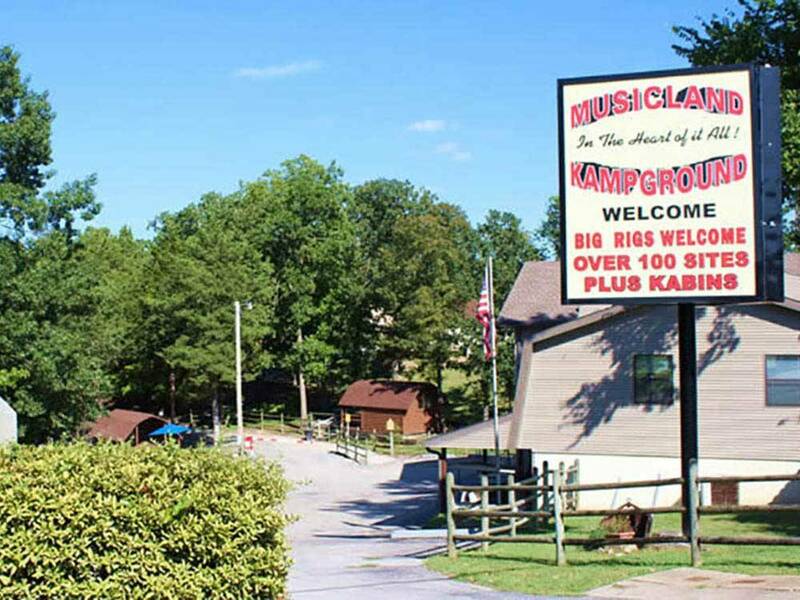 We stayed at Musicland Kampground 9/1915 thru 9/26/2015. The staff is excellent and very helpful. We needed their help a few times and they were outstanding. The sites are a little tricky to get into but they take you to the site and help you get parked. The site are very level! Even though you are in town, it is extremely quiet. Will stay there next time we visit Branson.